When her father goes to war, Ann Fay becomes the “man of the house,” pulling on blue overalls and taking care of all the farming that keeps the family going. At the same time, a polio epidemic hits the area, striking within her family and leaving Ann Fay with even more responsibilities. 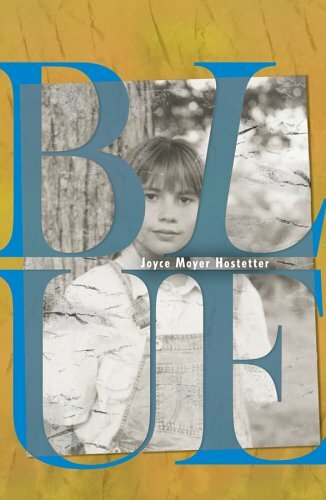 Blue, by Joyce Moyer Hostetter, is a historical novel with an emphasis on the history. I didn’t lose myself in the story so much as note the number of references to the times. World War II, the polio epidemic, Franklin Roosevelt, and Jim Crow laws are all included. There are also neighborly friendships, a close-knit family, southern poverty, and an untimely death. I actually don’t mean to be dismissive about the book, which was interesting and did a good job of placing the reader in another era entirely. I felt horrified at the predicament of a thirteen-year-old being left home alone to take care of her sisters for months while her dad was at war and her mom at the hospital. I knew someone in that family was getting polio, and it was very sad when it did happen. I couldn’t help but root for Ann Fay and her family to make it through the tough times. Overall, though, I felt less connected to the characters than educated about the time period.